While recalling the night of her beau's surprise proposal, Chrisley admitted, "Nic's family was in town and my whole family was there and we were filming and I was furious. I was like, 'The fact we're filming on Christmas Eve is absolutely insane. I have people here.'" However, she was in for the shock of a lifetime after returning home from a quick store run with her mom. "I walk outside and it's all lit up!" Chrisley continued. "And Nic's family is standing on one side, my family and friends are standing on the other, and then I just start freaking out because I'm like, 'This isn't really about to happen.'" Readers are most likely already aware that Savannah Chrisley is a 21-year-old beauty queen best known for her appearances on her family's USA reality TV series, Chrisley Knows Best. Since its 2014 premiere, the show has centered on the lives of self-made millionaire Todd Chrisley, wife Julie Chrisley, and their three children: Savannah, Chase, and Grayson. Meanwhile, 25-year-old Nic Kerdiles currently plays forward for the American Hockey League's Manitoba Moose and the NHL's Winnipeg Jets (via NHL.com). According to People, the cute pair were first romantically linked in November 2017. 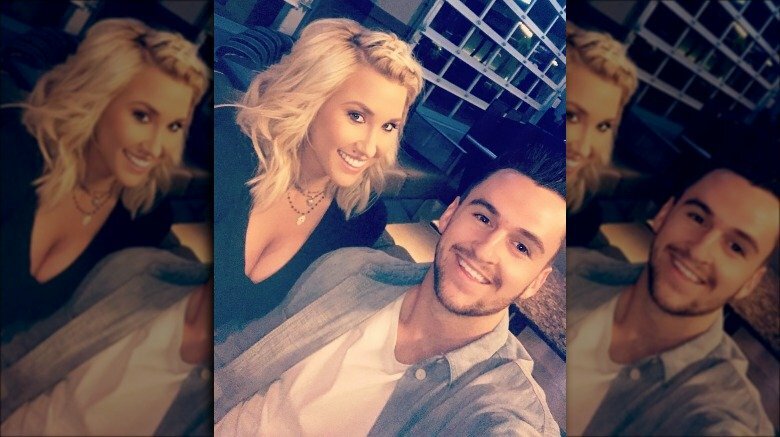 As Nicki Swift previously reported, Savannah Chrisley had most recently dated 22-year-old NBA star Luke Kennard. After the former couple's whirlwind romance came to an end in August 2017, the television personality told E! News that she'd "dodged a bullet." She added, "You live and you learn. I've learned a lot of things that I don't want and that's what relationships are for." 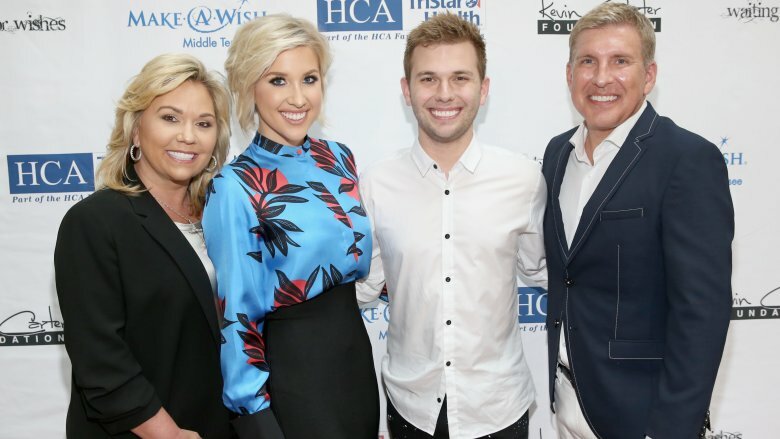 As for her future with Kerdiles, it sounds Chrisley has continued to apply these life lessons to the duo's engagement and won't be rushing into wedding planning any time soon. While speaking with People this week, she explained, "We're taking our time. Just because you're engaged doesn't mean you have to get married tomorrow … We know that we want to spend the rest of our life with each other." After the happy news broke, the television star took to Instagram to gush about her fiancé. "Well y'all…we did the dang thing!!" she wrote in part to her 1.7 million followers, captioning a sweet snapshot of the engaged couple. "Never in a million years did I think I would be this young and have found my forever person. You are the best decision I have ever made … I appreciate you more than you could ever imagine!! I love you ALOTTLE. I can't wait to be your wife." In a follow-up post, Chrisley showed off her gorgeous 5-carat engagement ring designed by jeweler Dror Flantzman. "I feel like I'm dreaming!!!" she shared alongside two crying-face emojis. "Many are asking why we waited so long to tell you…well…we just wanted to enjoy our time right after the engagement and just kinda figure out life!! We wanted it to be intimate and very private. But now we are so excited to share with all of you!" Savannah Chrisley's exciting romance announcement isn't the only reason she's making headlines this week. Growing Up Chrisley, a spin-off reality TV series starring herself and older brother Chase, 22, premiered on USA on Tuesday, April 2. The sister-brother duo recently opened up about the filming experience while living together in Los Angeles. While speaking with Page Six this week, Savannah quipped, "I wanted to kill Chase a week into it because he just — he is the worst roommate you could imagine … Our schedules are very different and like when I go to bed versus when he goes to bed — he's not the cleanest human being in the world." Yikes. For his part, Chase jokingly told the media outlet that he very much felt the same, adding, "Savannah, I'm clean. I'm sick of you saying this." For those who've tuned into the network's original series Chrisley Knows Best, it sounds like this spin-off will feature the same familial antics its fans know and love. According to Savannah, "We're just normal siblings. We fight. We have disagreements but at the end of the day it's us against the world. We will always have each other's backs no matter what."